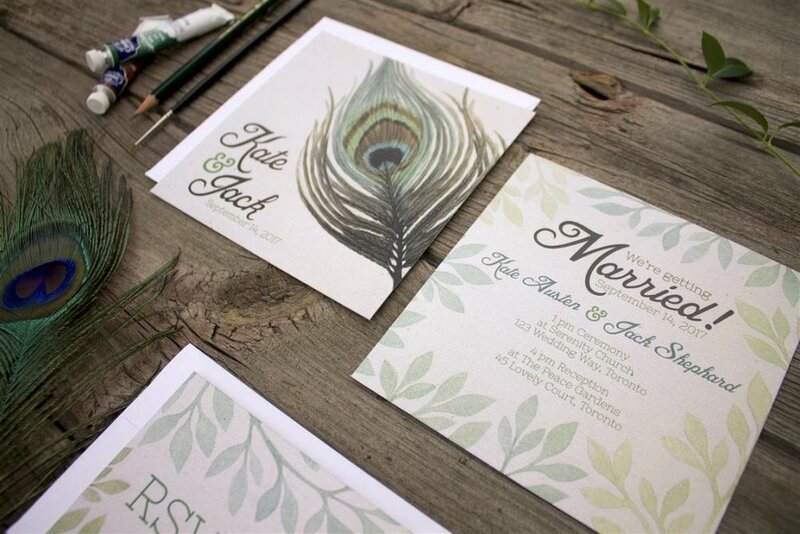 Make an elegant, cool and timeless statement with Peacock Feather Wedding Invitations and stationery! They’re bold and beautiful with a natural look and boho vibe. I’m a watercolour artist, so the artwork for each of my stationery designs has originally been hand-painted or drawn. After I scan the artwork, I can use it to design and create any coordinating pieces you need, from Save-the-dates to custom maps, place cards and signage. See below for an extensive list, but if it’s paper I can likely make it happen! All of my invitations and cards are DOUBLE-SIDED to showcase the artwork and text, while giving your guests a WOW factor! paper items you may like! Textured paper (linen or cotton), coloured, kraft, or textured envelopes can be substituted for additional cost, at request. 1. Personalization of the wording is ALWAYS included in every piece, to perfectly reflect you as a couple! 2. If you love certain aspects of this design but would prefer some alterations (such as colour or font changes) you can request a SEMI-CUSTOM design and I can make it perfect for you! I'm able to combine different designs, change layouts and fonts. Additional fees apply. 3. If you're looking something completely different and new, a CUSTOM option is your best fit! You can have an original painting and theme designed to your specifications, and the best part? You'd get to keep the original painting to frame! Additional fees apply. © 2019 Alicia Bint | Alicia's Infinity, all rights reserved. The illustrations contained throughout these pages may not be copied or otherwise reproduced without the expressed written permission of Alicia’s Infinity. Thank you!